Apple's iPhone may have revolutionized the smartphone, but the iPhone maker has now fallen behind its competitors in some respects, says Apple cofounder Steve Wozniak. Wozniak spoke with German publication Wirtschafts Woche in an interview ranging from the early days of Apple to why its co-founder still waits in line in order to buy new iDevices. He said that the company he started with the late Steve Jobs is facing stiffer competition, particularly from chief rival Samsung. "Currently we are in my opinion... somewhat behind," Wozniak said about Apple with regard to features. "Others have caught up. Samsung is a great competitor. But precisely because they are currently making great products." Apple and Samsung currently take the lion's share of profits in the mobile phone market, with nearly all major competitors' mobile segments reporting losses. The two firms take widely divergent approaches to the market: Samsung releases a wide range of devices across many price points, while Apple relies on its one iteratively improved iPhone. Wozniak has never been shy when speaking out about what disappoints him in the company he helped found or what he likes from its competitors. Last year, after Microsoft unveiled its Surface tablet, Wozniak quipped in an interview that the visual aesthetic of the device made him think "Steve Jobs came back reincarnated" at Microsoft. In September, as the fiasco over Apple's Maps app continued, Wozniak expressed his disappointment in the Maps app, though he did question how severe the issues with the program were. Despite his belief that Apple lags its competition in some features, Wozniak was confident of the company's ability to remain profitable and stay on a winning streak. The firm's philosophy from the start, he said, was to establish a good profit margin. "Apple was profitable from the start. [Original angel investor] Mike Markkula always preached that one must have a good profit margin." He also credited Apple's enduring fan base as a reason for its high profit margins, crediting the company for maintaining that loyalty by continually releasing products to ensure that loyalty is "kept alive and confirmed." "The launch of a new Apple product is for me like a big, major concert in which you absolutely must attend personally. It's history. Sure, I could order online or call the store manager... But that would be nothing. No, I will have the experience like any normal customer. But one thing is certain. If Apple would make lousy products, I would not be in line." Why is he always barking ? If he is great enough , he would have been the second Steve jobs . Behind in "some features"? It would be helpful to say which features. Without specifics it just sounds like empty complaints. Can someone explain, exactly, how iOS is behind Android? Or is it "sales?" If Apple gave away phones, they'd have a perfect market share too. Otherwise, I just don't see it. Am I missing something? [I]The next time we want your opinion Mr. Wozniak, we'll give it to you. Actionable notifications, quick toggles for settings, choice of default app for a given action, widgets, NFC, sharing from one app to any other app that can share, drag and drop files over USB, etc. 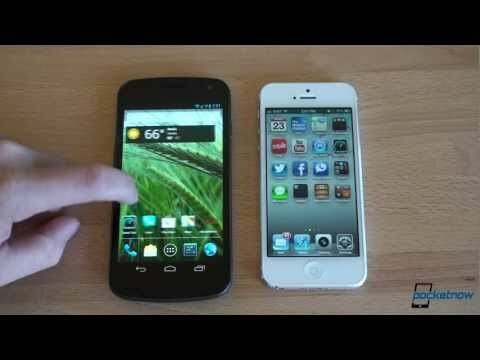 If you're not familiar with some of the more recent Android features and how they compare to iOS6 PocketNow posted a video comparison. It's not the most recent version of Android (one behind I believe) but still good for taking a look. Once iOS has widgets and NFC I think you'll agree with me. Scrolling and general smoothness is still better on iOS, but that's not what I would call a feature. Get a Nexus, get updates. Tablet apps are still lacking on Android. I've never resold a phone. While I understand not all of these features don't appeal to you but for most of the population they do. I'm over these inept comments from Woz. What has he done in the past 20 years? He's never designed a phone. He's never designed a GUI. He's just another consumer. Who cares? I would imagine he is talking about hardware, and Apple has pretty much always lagged in HW adoption. Your user name is quite appropriate. Two reasons: One, most people already know what features are missing and two, knowing he's likely to be he doesn't want to sound as if he's piling on. The man still loves Apple but it's a rational love unlike some around here. He didn't specify iOS. I think most would agree that iOS is still far ahead of Android but not so much in the hardware realm. Oh, gee...maybe because he's the co-founder of Apple? I'd say his opinion matters much more than yours or mine. The next time we want your opinion Mr. Wozniak, we'll give it to you. I want his opinion and so do most rational Apple lovers. Besides, his statement is very valid and he's not the only one to say it. Look at the latest Galaxy's...I find myself wanting to pick them up and look at their screens. That didn't start happening until the past year or so. They've caught up in some respects. My hope is that Apple is not filled with employees who frequent this forum because the majority here seem to be unable to admit any deficiency on Apple's part or admit any successes from the competition. Hopefully, Apple is filled with employees who want to tackle the challenge of making the next iPhone far surpass anything Samsung has put out. If you want all that on iOS can't you simply buy a phone that runs on Android? Your opinion on "behind" seems to boil down to Android does some things differently or includes features of questionable value (NFC). I assume from your opinion you prefer the Android way. It's like saying the iPhone is "behind" because it does not have a 5" screen. If you do want a 5" screen, then Apple is certainly "behind" in that sense. Seriously? What the **** is wrong with people nowadays? The *FOUNDER* of Apple cannot have a different opinion from you? Or say anything that is even slightly critical? Try Battery Doctor for the memory use. It pulls a lot of information that is impressive! Thank you! I couldn't agree more. It's lunacy. I compare it to people's views on Lindsay Lohan. The president of her fanclub probably says, " There is nothing wrong with her, she's the greatest actress ever and everyone that says otherwise is just a hater or troll!" A family member that loves her says, "She has some issues she's working through but she is a great person and great actress and we're here to support her." An ex-lover says, "She's the worst person in the world and has no redeemable values." Well, this forum has become an Apple fanclub with a lot of presidents that don't tolerate dissention. Myself, I'm an Apple lover, which means I admit faults because I hope they will address them so they can continue to be great, but I don't dwell on them either.